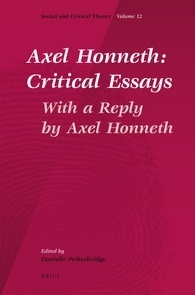 Axel Honneth: Critical Essays brings together a collection of critical interpretations on the work of Axel Honneth, from his earliest writings on philosophical anthropology, his reappraisal of critical theory and critique of post-structuralism, to the development and extension of the theory of recognition, his debate with Nancy Fraser and his most recent work on reification. The book also includes a comprehensive reply by Axel Honneth that not only addresses issues and concerns raised by his critics but also provides significant insights and clarifications into his project overall. Danielle Petherbridge is Lecturer in Philosophy at University College Dublin. She is co-editor (with Jean-Philippe Deranty, John Rundell & Robert Sinnerbrink) of "Recognition, Work, Politics: New Directions in French Critical Theory" (Brill, 2007).